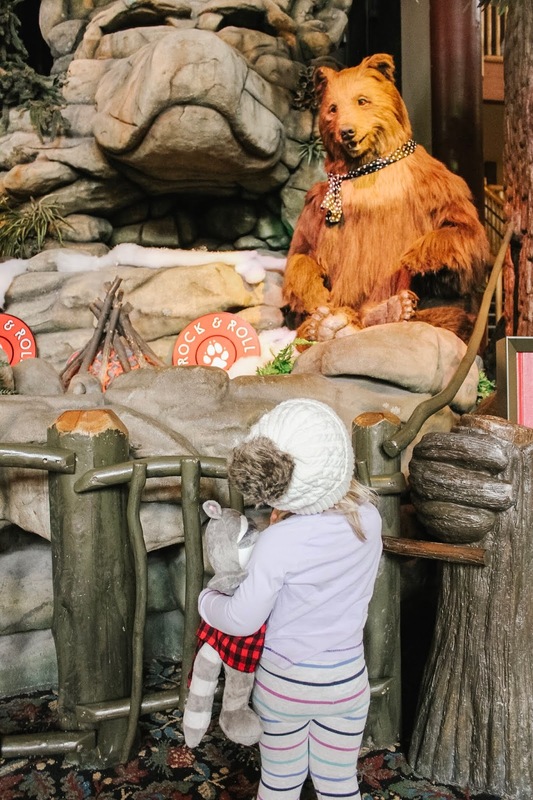 Looking for the perfect family adventure in southern Ontario? 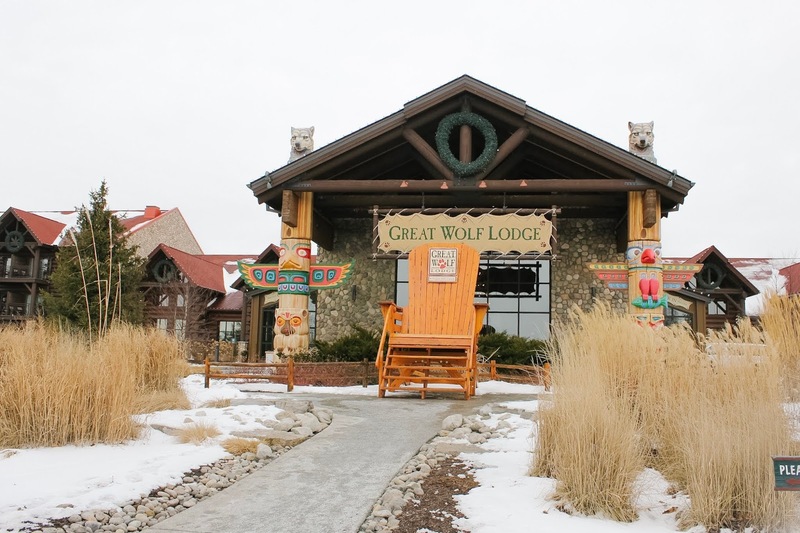 Whether it’s minus twenty or pouring rain outside, it’s always warm and sunny at Great Wolf Lodge in Niagara Falls, Ontario. 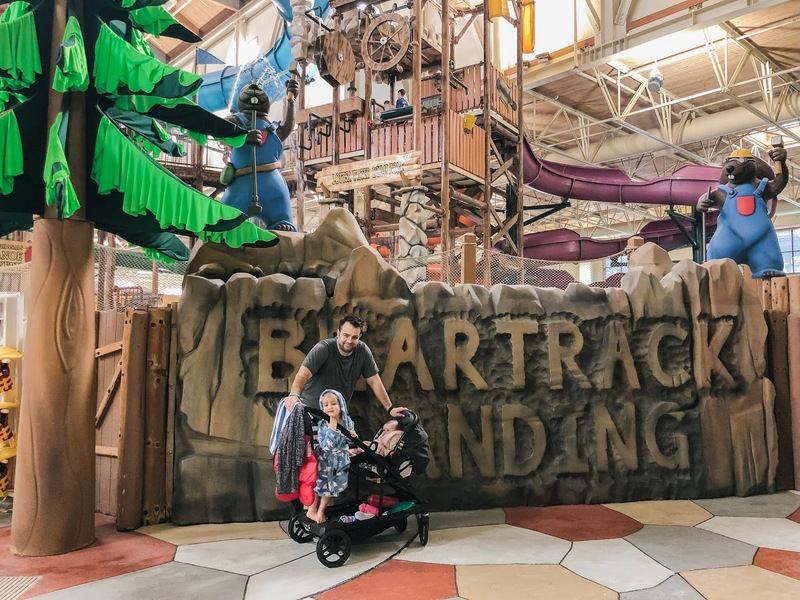 Read on to learn why Great Wolf Lodge is the perfect indoor vacation destination for families in southern Ontario. 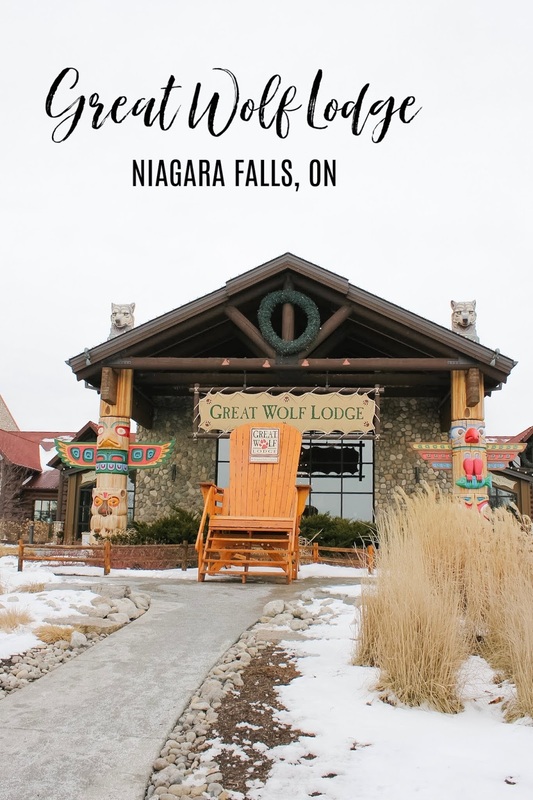 Last month, we escaped the big city and spent a night at Great Wolf Lodge in Niagara Falls, Ontario. With a water lover at home, we had talked about a visit for about a year. We went back and forth for some time, hesitant to book not knowing if it would be too old for our almost 3 year old. We were a bit afraid that it would be a waste of money, and that there would be nothing there for her to do. After receiving a gift certificate for Christmas, we were given the push we needed to book a stay. And, after talking with friends that had also visited with young children, we realized it would be the perfect time to take the girls. And, we’re so glad that we did. 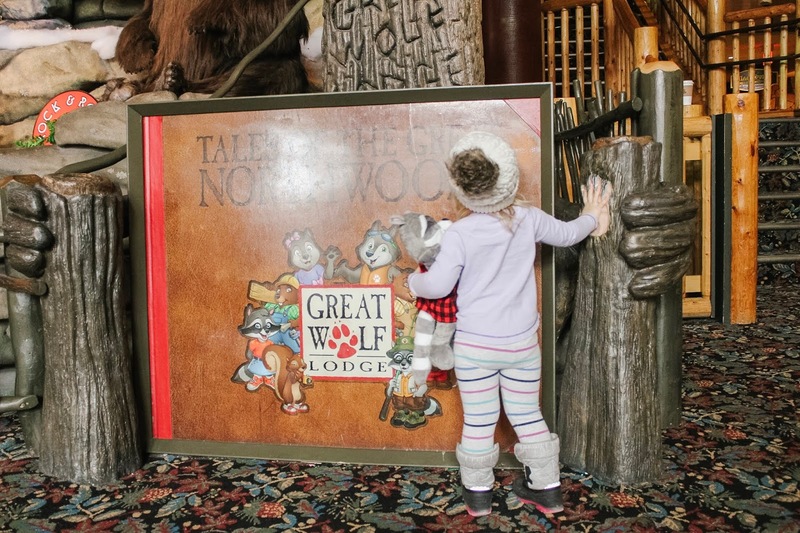 Located along the Niagara Gorge, just five kilometres from Niagara Falls, Great Wolf Lodge is one of North America’s largest indoor waterpark resorts, and the perfect family-friendly indoor vacation destination. We arrived at 4:00pm, check in time. Walking in, I was in awe - the grand lobby was filled with kids in their bathing suits running around and parents trailing after them. With a massive fireplace, antler chandeliers and a fishing cabin-theme, I knew we were no longer in the big city. 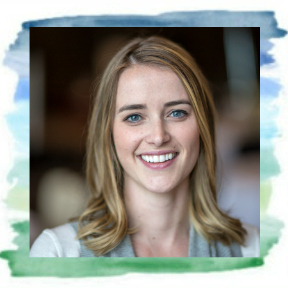 With two little ones in tow, vacations are no longer what they used to be. Stepping foot in the lobby for the first time, I instantly realized what we were in for - from here on out, it’s all about the girls. Let’s get straight to the point. 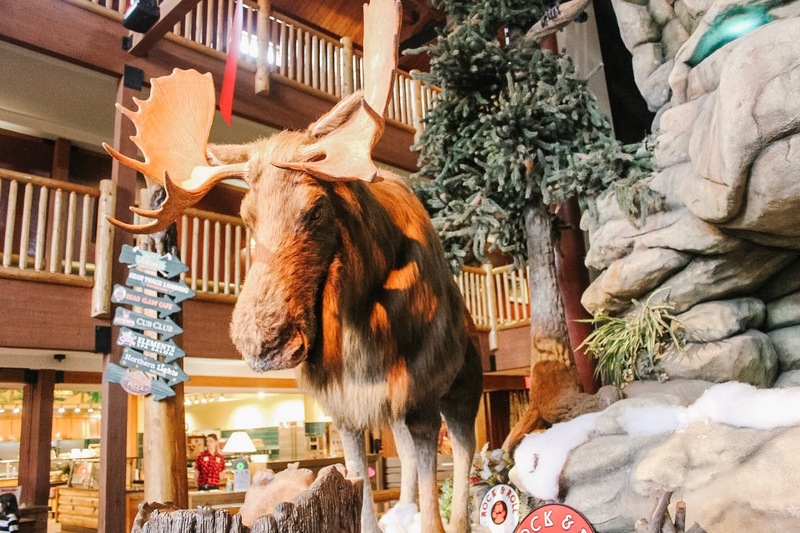 The highlight of Great Wolf Lodge? That would be the humongous 103,000 square foot indoor waterpark, featuring 2.5 million litres of water, 13 water slides, 6 pools and a four-storey tree house water fort. The best way to describe it? Wow. Just wow. 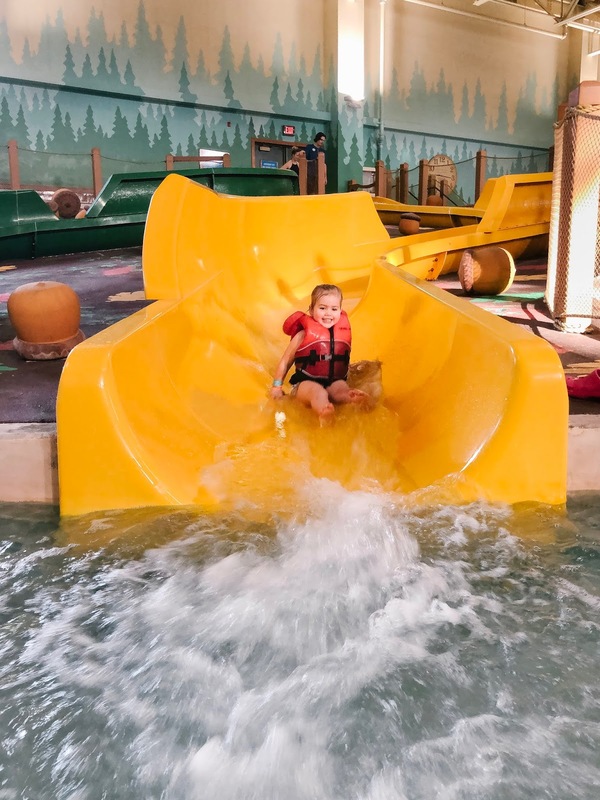 The waterpark is an ideal escape for everyone, offering an environment that provides for family bonding time as well as safe, supervised, yet independent kid-friendly fun. It is open from 9:00am to 8:00pm daily, and on the day of arrival, guests have access starting at 1:00pm (3 hours prior to check in). Upon walking in, children are measured and given a different coloured wristband depending on their height. The colour corresponds to which slides they can go on. We spent the majority of our time in Chipmunk Cove - a shallow water area with a fountain forest - and on the kiddie slides (located in the same area), perfectly sized water slides with gentle slopes and tiny dips and turns. It was so fun to watch Morley break out of her shell and go down the slides all by herself. We also explored Fort Mackenzie, a multi-level water fort tree house and took a dip in Rainbow Lake (the wave pool) and Crystal River (the lazy river). While we brought our own, we were happy to see that life jackets are available for use. They have a few different sizes and can be found first come, first serve at the entrance to the waterpark. One thing that I appreciated about the resort was that there was never a need to carry a wallet or purse. A good thing when you’re around 2.5 million litres of water! Instead, it’s all in the RFID waterproof wristband, which acts as your room key, credit card for purchases in all retail shops, bars and restaurants and for all services, and even identification, say if you get separated from your children. After a quick bite, it was back to the lobby for nightly story time - a chance for the kiddos to put on their pjs, grab their favourite stuffy and sit down to hear the forest friends and a very lively staff member read a few favourite storybooks. Throughout the day, the lobby is fun (and dry) source of entertainment for the kids. 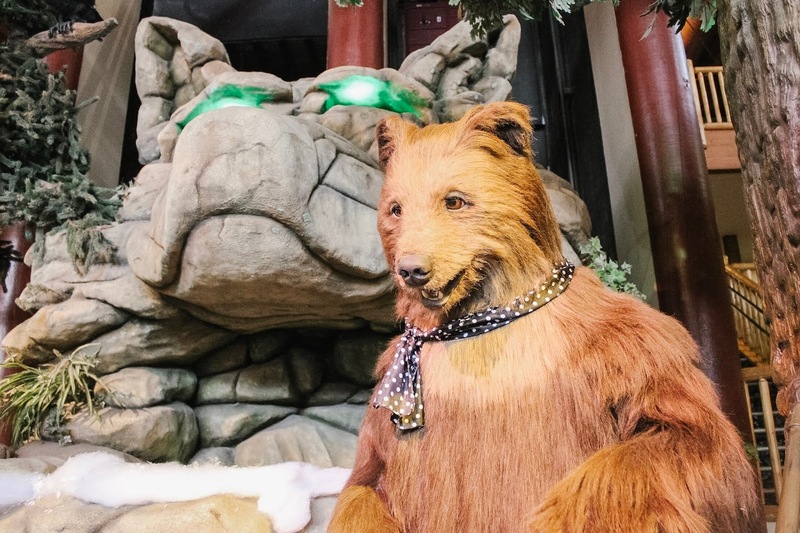 Aside from story time, there are performances featuring animated friends of the forest who come to life and sing, dance parties, character meet and greets and more. 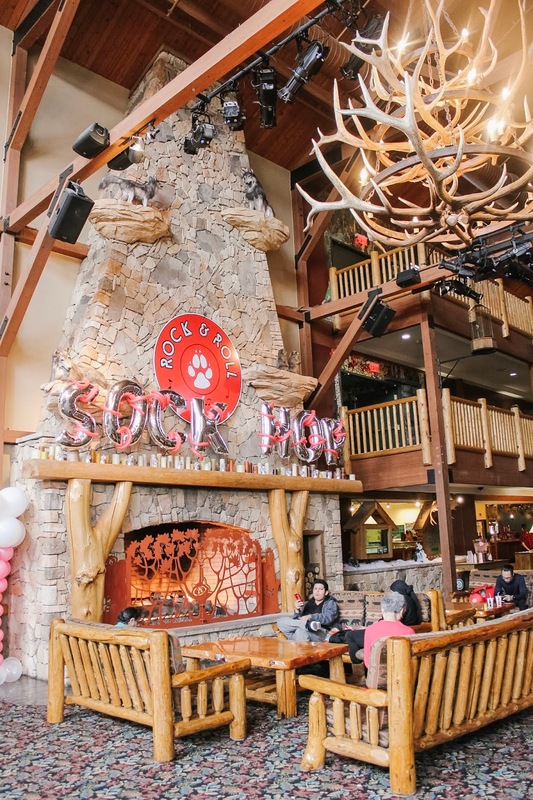 In total, the resort has 406 guest rooms made up of 10 different configurations, all designed with the rustic charm of a Northwoods cabin. We opted to stay in a Family Fireplace Suite which included two queen-sized beds, a full-size sleeper sofa in the semi-private living space and a fireplace. If we are to visit again when the girls are a bit older, we would definitely book a KidKamp Suite which features a tent-themed sleeping area with bunk beds. The majority of the resort’s suites open onto a large deck or patio (perfect for a summer visit) and also include a semi-private living area, full-size bath, one or more TVs, in-room safe, refrigerator, microwave, coffee maker, hair dryer, free WIFI and more. Pack and play cribs are also available upon request. After a much needed sleep and a quick bite to eat, we put our bathing suits back on and headed down to the watermark one more time before saying goodbye to our forest friends and making the 1.5 hour drive back to Toronto. It’s safe to day, both girls slept the entire way. This is a BIG one, and one of the reasons we almost didn’t book a stay. At just shy of 3 years, our oldest had a blast! For that age, I recommend only one night. They can take part in all of the free activities (story time, character meet and greets, etc.) while still enjoying the waterpark for a good length of time. Between the wave pool, lazy river and kiddy area (with four slides), there was enough for Morley to do that she didn’t even notice the bigger slides. In order to ride the kiddy slides in Chipmunk Cove, I strongly recommend they be comfortable and confident enough in the water as they have to ride the slides by themselves (parents can wait at the bottom). Our 6 month old also loved sitting in the water watching all of the kids in the pool. 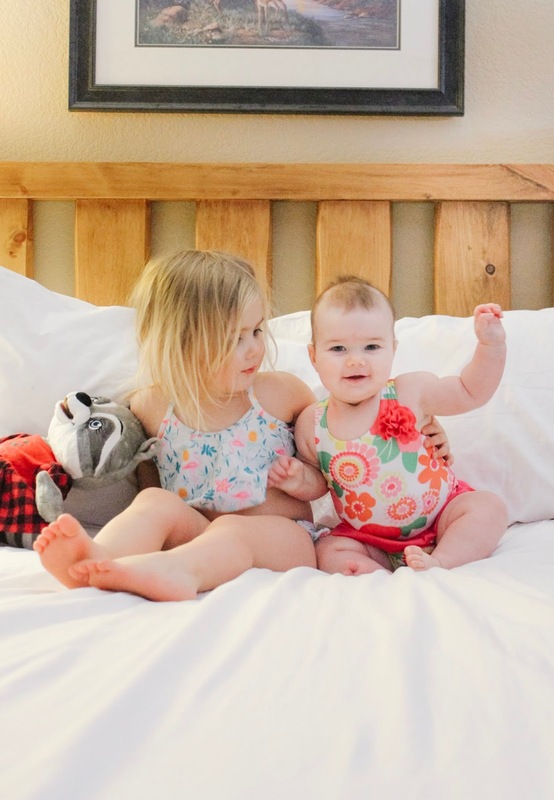 She had a grin from ear to ear as she splashed and watched her sister. As kids get older, the pricier the trip gets (like anywhere, I guess). For kids 6 years plus, I recommend 2 nights. They can ride more slides in the waterpark (ability to ride goes by height) and take part in more of the paid activities at the resort (arcade, MagiQuest, etc.). With the volume of people they see, I was surprised how clean the resort was, both in and out of the waterpark. The water is obviously heavily chlorinated, and you will be smelling it for days after your visit. For example, I took a few showers to get the smell out of my hair and two washing cycles to get the smell out of our clothes. That being said, I would rather it be heavily chlorinated than not enough chlorine. For the amount of chlorine, you would expect the decor to look “aged”. This is what I experienced at a previous indoor waterpark I had visited. However, there didn’t seem to be any wear and tear to the decor and structures, which means it is well cleaned and maintained. Yes, it does come with a bit larger of a price tag than other hotels, but remember that with the room cost, you are also receiving admission to the waterpark on both days. 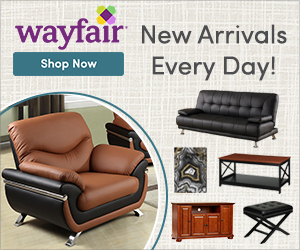 Be sure check out the “Special Offers” section on their website to learn more ways to save. Before visiting, I asked friends this same question. Their advice was that it is expensive and that we should bring our own food in terms of snack, lunch and breakfast. And so, we did. I loaded our cooler bag and to be honest, we didn’t end up eating half of it. A few reasons why - we were only there one night (total 22 hours) and we are a small family with young kids. For dinner, we ordered a pizza (and two beers) delivered to the room. A large Hawaiian was $22.99 and beers were $7.99 each, which we thought was comparable to if we went out to a restaurant. For our two adults and one child eating, this was a reasonable cost. However, if you have a larger family, or kids that eat more, I could see it being more expensive. If you are going to bring your own food, there is a mini fridge and microwave located in the room. Keep in mind, outside food is not allowed in the waterpark. There are two restaurants in the waterpark area to order from. By the way, the pizza was delicious. Have you been to Great Wolf Lodge? Where is your favourite family-friendly vacation destination? I’d love to hear!